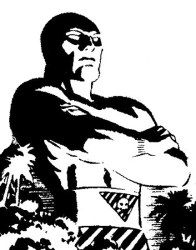 The Phantom is the title character in the American comic strip "The Phantom". He made a guest appearance first time in the story Mandrake's Wedding at Xanadu as "Kit Walker". 1939 Daily "Mandrake in North Africa" indirect reference, Lothar becomes prince of Wambesi. 1967 Sunday "The Blackout Caper" easter egg, on tv. 1971 Daily "The Clay Camel (plus Women's Lib!)" easter egg, on a comic book cover. 1976 Daily "The Evil Twin" easter egg as Mr. Walker, on a comic book cover. 1977 Sunday "Old Folks" easter egg, on a comic book cover. 1977 Daily "The Cooler" easter egg, a daily strip in the newspaper. 1977 Sunday "Mr Ttazz" cameo, Kit Walker mentioned and seen as a picture. Also the Kit Walker Stadium. 1985 Daily "The Hijacking" easter egg, on a comic book cover. 1986 Sunday "The Lost City" Defenders of the Earth promotion. 1988 Sunday "The Young Prince" easter egg, a Phantom doll. 1989 Daily "Matter Mover" cameo, Kit Walker mentioned and seen as a statue. 1991 Daily "The Terrorists" easter egg, on a comic book cover. 1991 Sunday "The Million Dollar Tour" easter egg, on a poster: Phantom the Musical. 1992 Sunday "The Prison Break" easter egg, on a t-shirt. 1995 Daily "The Monster Thief" easter egg, Phantom mask in a toy shop. 1995 Daily "Pursuit of the Cobra" easter egg, Phantom mask in a toy shop, a man in the barber chair read the newspaper Jimmi Wells Found. 1996 Sunday "The Swarm" easter egg, "Old Jungle Sayings" a book with a picture of the Phantom on the cover. 1996 Sunday "Dr. Holton's Reputation" easter egg, Mandrake is reading "Fantomen", a Swedish Phantom comic book. 1996 Daily "Alibi Algie" easter egg, Slam Evil poster (the Phantom movie). 1997 Daily "Scary Aliens" easter egg, on a cap. 1997 Sunday "Speedy" easter egg, Slam Evil poster (the Phantom movie). 1997 Daily "Mandrake's Wedding at the College of Magic" easter egg, in a newspaper. 1998 Daily "Mandrake's Wedding at Xanadu" cameo, as Kit Walker. 1998 Sunday "Mandrake Marries Narda" cameo, as Kit Walker. 1999 Daily "The Haunted Ballroom" easter egg, on a t-shirt. 1999 Daily "The Secret Mission" easter egg, Phandrake - a giant navy yacht. 1999 Daily "Siege at Xanadu" easter egg, on TV and on a comic book cover. 2001 Sunday "Return of the Tourist" easter egg, on a t-shirt. 2002 Sunday "Shadows on Devil Road"
2005 Daily "Blizzard of Crime" easter egg, The Phantom movie tag line on a t-shirt. 2008 Daily "The Unknown Island" mentioned only. In Defenders of the Earth, Mandrake is one of the defenders, and has the adoptive son Kshin. This page was last edited on 7 January 2019, at 23:20.